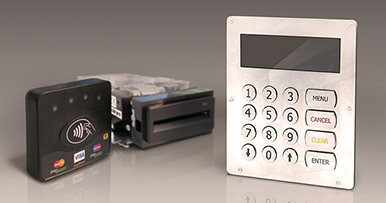 Integrated payment terminal with encrypted PIN Pad and display. An ideal cashless payment solution for parking spots, gas stations, transport ticketing machines, and other outdoor self-service payment kiosks where PIN-based authorization of card transaction is required. Possibility to integrate with external contact and/or contactless card reader for additional acceptance of chip, magstripe cards, and NFC devices. Fully independent solution from kiosk’s CPU with certified secure PIN-based card transaction processing environment.